Stuffed Cabbage is a classic Jewish recipe that makes a great addition to your Hanukkah dinner! Most beef stuffed cabbage recipes can be pretty fattening and caloric, but this slimmed down version is sure to make you jump for joy. Each 2 roll serving has just 6 Weight Watchers Points, and the taste is so amazing, no one will even know that it’s a Weight Watchers recipe! They are very easy to make and they serve as a great dish to take to a holiday gathering or potluck dinner. So if you are looking for a delicious Hanukkah recipe that is tasty, impressive and low in Points, give this one a try – your friends and family are sure to love it! **Wanna turn this into a 4 Point Weight Watchers Recipe instead? Just substitute the rice for Orzo Miracle Noodle instead! Tastes the same, but you’ll knock 2 whole Weight Watchers Points off of each serving!! Woohoo!!! Heat oil in a large stockpot over medium-high heat; add rolls and saute until golden brown on all sides, turning frequently, about 5 minutes. Add tomatoes and bring to a simmer. Reduce heat to low, cover and cook until cooked through, checking pot every 15 minutes and stirring to prevent sticking, about 1 hour. (If sauce thickens or reduces, add water.) Enjoy! Are these points plus or smart points? 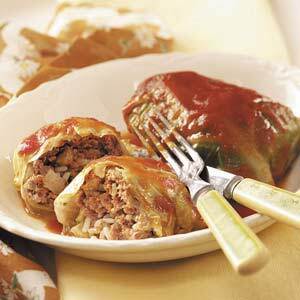 My favorite stuffed cabbage recipe. And it works with WW Points. Love It!